Immediately posterior of the cloaca are a left/right (L/R) bilateral pair of sensilla called the post-cloacal sensilla (PCS) (MalePCSFIG 1). Like the hook these sensilla are embedded in sclerotized cuticle. Each post-cloacal sensillum contains the endings of 3 sensory-motor neurons, PCAL/R, PCBL/R and PCCL/R. In each sensillum the neurons are surrounded by sheath cells (PCshL/R) and socket cells (PCsoL/R). Sensilla also contains a third epithelial cell PCh (formed by fusion of PChL/R); MalePCSTABLE 1). Cells of the PCS are derived from the L1 rectal blast cells Y and B (MalePCSFIG 2). MalePCSFIG 1A: The adult male cloaca. Nomarski DIC showing the cloacal opening and post-cloacal sensilla, ventral view. Inset shows epifluorescent images from transgenic animals expressing the ajm-1::GFP reporter gene. The cell bodies of each left and right sensillum are grouped together in the left or right cloacal ganglia (CGL/R), located on either side of the proctodeum. Cell body positions are relatively invariant and can be most clearly observed in late L4 (MalePCSFIG 1B; see PCS Cell Identification Guide by L. R. Garcia). 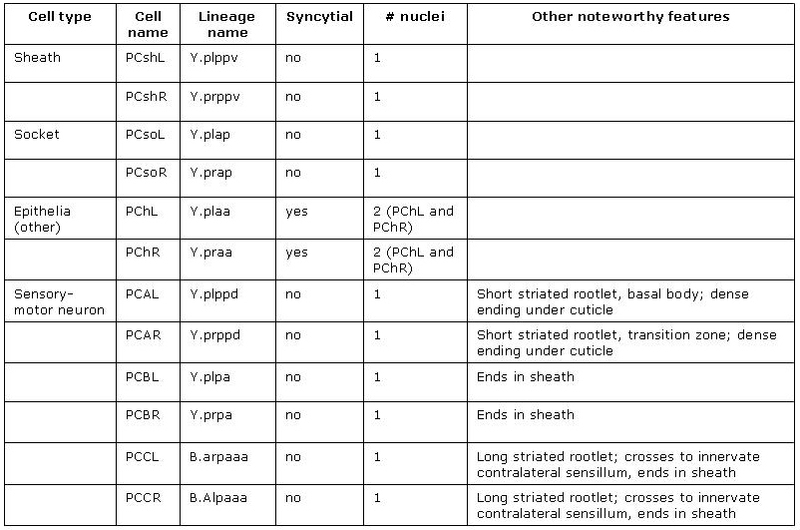 MalePCSTABLE 1: Summary of PCS cells. From the CGL/R, PCS neurons send axons anteriorly into the preanal ganglion (PAG) (MalePCSFIG 4A) and dendrites posteriorly to the sensilla. PCBL/R neurons end in the sheath. 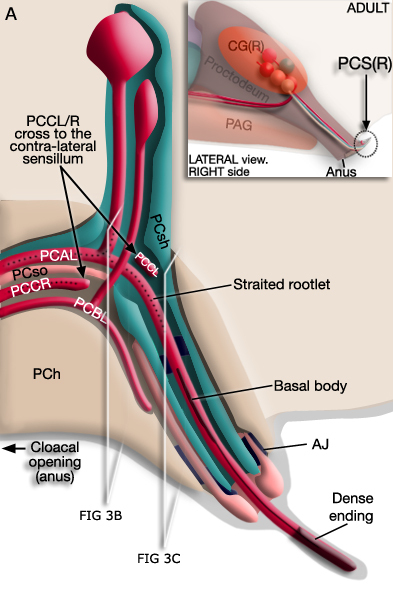 PCAL/R cilia extend the furthest, ending in the cuticle. 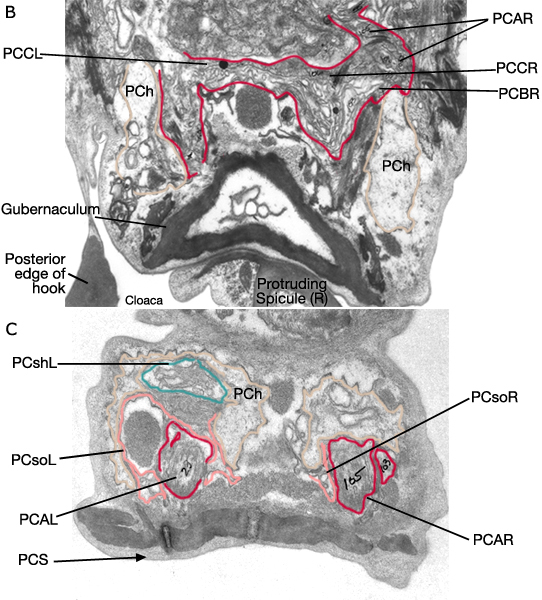 PCCL and PCCR neurons cross just posterior to the proctodeum and end in contra-lateral sensillum (MalePCSFIG 3). Targets of the PCA, PCB and PCC neurons include each other, the hook neurons (HOA and HOB), spicule neurons (SPCL/R and SPD), male-specific muscles and the gonad (The Male Wiring Project). 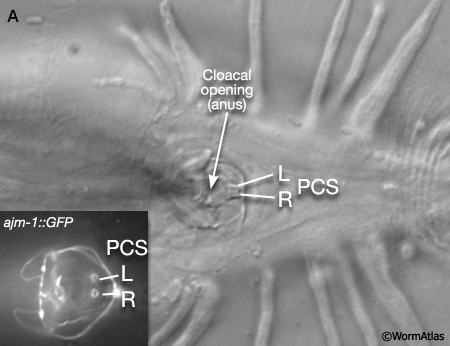 These connections ensure that vulval location (by the PCS and hook) are coordinated with the subsequent steps of spicule insertion and sperm transfer (reviewed in WormBook: Male Mating Behavior - Barr and Garcia). PCS neuron dendrites form NMJs with male-specific oblique and gubernacular muscles en route to the sensilla (MalePCSFIG 4B; see also Male Muscle System - Male-specific Muscles). Innervation of the oblique muscles may ensure that the tail adopts the appropriate posture for spicule prodding and insertion. Gubernacular muscle stimulation may facilitate spicule movement through the proctodeum by lifting the gubernaculum. In the preanal ganglion, PCBL/R and PCCL/R axons (and SPCL/R ) run on the dorsal surface of the ganglion and have synapses directed towards the gonad (MalePCSFIG 4C).